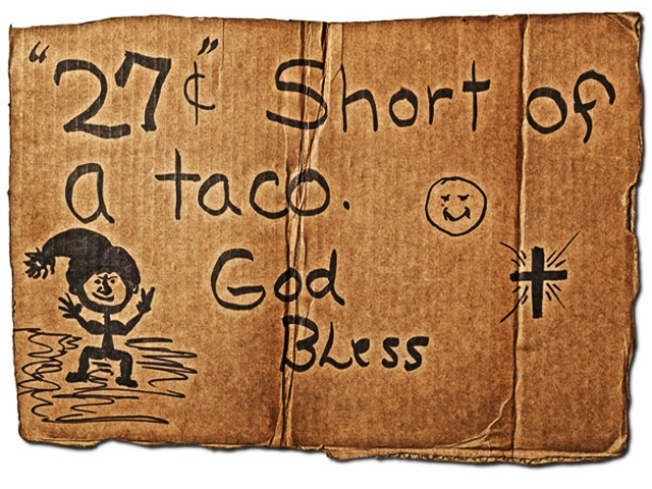 From "Signs," a photographic essay about homelessness. HOMEWARD: Pentagram Papers – the indie publication that’s explored unusual topics since 1975 – has just released “Pentagram Papers 39: Signs,” which casts a lens on the plight of the homeless through their faces and handmade signs. It’s timely, moving stuff, made all the more so by a foreword from musician, Springsteen collab and formerly homeless Joe Ely. Check it out online. (We also recommend the 2006 Pentagram Papers retrospective; $60 at St Mark’s Bookshop, 31 Third Avenue at East 9th Street; 212-260-7853). GET SOME RELIGION: At the Manhattan outpost of the Brooklyn curiosity-antique outfitters In God We Trust, a weekend-long sample sale takes 50% off spring and summer merch, and 75% off that of previous seasons. Plus, we hear there’ll be jewelry in the $10-and-up range. 265 Lafayette Street near Prince Street; 212-966-9010. MOVED: Housing Works may have just landed in Tribeca six or so months ago, but it’s already decamped to a new address in the neighborhood. The quality thrift-store chainlet, whose proceeds go to benefit those living with AIDS, opens its new space today at Chambers Street between Church Street and West Broadway – and it’s four times larger than the old one, the better to deal with the booming business in the secondhand world these days. More details on Racked. CUT, PRINT: We love New York native Aimée Wilder’s groovy, fresh wallpaper prints – look closer, and what seemed like a simple geometric design turns out to be a pattern of tiny sumo wrestlers or pigeons, or rainbow-colored robots. About $150 for three 27" x 15' rolls, available at aimeewilder.com. THREADBARE: We’ll readily cop to being obsessed with pre-worn jeans. The heavily distressed Slim Slouch style from Madewell suggests you hitchhiked around the world twice with a single pair of pants. Loose up top, skinny on the leg, and available in two different washes; roll or crop them a bit below the knee for extra beach-bum appeal. $95 at Madewell, 486 Broadway at Broome Street; 212-226-6984.